Hegang is another town that's been a major mining centre for many years and is now in decline. 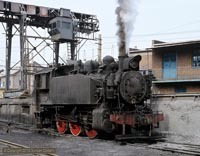 Like Fuxin, much of the system is electrified but a significant proportion of traffic is hauled by SY class 2-8-2s. These pictures were taken on a short visit to the depot at Hegang in 2005 and a longer stay in March 2007, just before steam gave way to diesels.